You can tell that the market is changing, as there is a rash of new (old) "how to get rich in real estate" opportunities popping up on the web. While you might expect somebody in the real estate industry (me perhaps) to either say "now is the time to buy" or the opposite "beware of false promises," I actually have a completely message to share. The Florida real estate investments market is for serious investors only. The market has changed and the players are bigger and tougher. 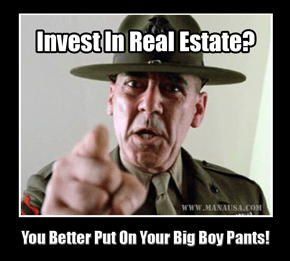 If you want to get active as a real estate investor, you had better put on your big-boy pants! The days of competing locally for the best real estate investments is over, so expect some serious competition if you plan on becoming heavily involved with real estate as an investment. Ten years ago, it was not common to have institutional investors roaming around the Tallahassee real estate market. They were fixated on larger properties in larger markets. But something has changed. I believe the collapse of the mortgage market created a bridge for "big money" to get into the smaller properties that produce such a high rate of return. It started with them buying pools of loans, and then they realized there exists a mechanism to invest locally without having to spending a deal-breaking amount for analysis before purchase. This "marginal cost of acquisition" is what kept Wall Street off of Main Street, but real estate brokers have shown them how they can do and keep their costs down. But this is only part of it, because the big money firms have discovered a hidden industry that only recently has come to light. When I started in the real estate industry 23 years ago, the majority of the student housing in Tallahassee was owned by local "Mom and Pop" investors. But take a ride today down West Tennessee Street and you will see what the future (present) of student housing looks like. And Tallahassee is not alone. College towns all over the US are seeing institutional investors getting involved in student housing, and the impact has not yet really been realized on the street. Imagine you own a nice portfolio of 15 or 20 single family homes and townhouses near FSU that you have been renting to students for many years. You have seen up-cycles and down-cycles, but what about a complete change in consumer demand? Students can either live in your "quaint" 3 bedroom home built in the 1970s, or they can go rent a room in a "student village" that features restaurants, technology, swimming pools, fitness centers, and attractive co-eds. There is only one way you can compete with them. That's right, rental rates on single family homes near the schools are going to be under serious pressure as these thousands of units hit the market, catering to a changing student market. If you are a real estate investor, you can still make great returns on student housing, but you better use a different proforma than you might have used several years ago. If you are part of a larger real estate investment fund, you should know that there is only a small (but growing) competitive field out there. Get going while you still have few people who can match your resources. I wrote a white paper on real estate for the institutional investor a year ago, and it is even more pertinent today. 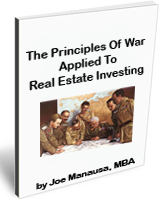 I encourage anybody at any level of spending to take the time to read "The Principles of War Applied To Real Estate Investing," as it might help you understand why "big money" has such an advantage today, and what it takes to compete with and among them. Have been reading your blog for several years now. Your website is now probably the most important source of information for me to learn about Tallahassee's real estate market. Given the current market for larger/luxury homes, we are thinking about renting out ours. Can you share your thoughts on the upscale rental market ($2500 per month and above)? Your general assessment of this segment (how easy to rent, what kind of houses/condos, locations, etc. )?